Enviro Liner® 6000x is a specialized fortified polyolefin alloy that is designed for extended life in most geomembrane applications. Fortified geomembranes are manufactured with special prime grade resins that are stabilized with advanced UV stabilizers and antioxidant additives. This provides the geomembrane with superior physical, mechanical, and endurance properties. Enviro Liner® 6000x is fortified with the latest in Ultra Violet/Anti Oxidant (UV/AO) stabilization packages that provides exceptional UV resistance. It is designed for long term exposed applications and very good chemical resistance. It is an excellent product choice for applications such as landfill caps, secondary containment of hydrocarbons, frac produced water, tailings dams, and waste water containment. Enviro Liner® 6000x series is manufactured by Layfield in North America and is available in thicknesses of 20, 30, 40, 50, 60 and 80 mils (0.5, 0.75, 1.0, 1.25, 1.5, 2.0 mm). Enviro Liner® 6000 is also available in one or two-side textured and a conductive version is available by special order. Every step in the production of an Enviro Liner® 6000x geomembrane is completed to our ISO 9000 quality management system. The Enviro Liner® 6000x series has been tested for various key performance properties and the results of these tests have been documented in this booklet. Both standard and extended warranties are available on approved applications for our Enviro Liner® 6000x series in thicknesses of 30, 40, 50, 60 and 80 mil (0.75, 1.0, 1.25, 1.5, 2.0 mm). 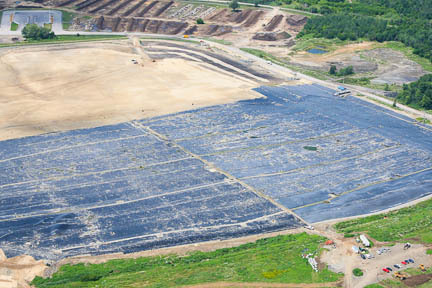 Enviro Liner 4000 is Layfield's line of LLDPE flexible geomembranes. The Electrical Leak Location method is a proven technique for finding defects in completed lining systems for repairs, maintenance, or as part of QA testing. Nonwoven needle-punched geotextiles offer excellent water flow properties for drainage and other applications.